Another year is drawing to a close, so that means it's time for my Christmas break from blogging. Thank you to everyone who reads my blog, comments, gives advice, book recommendations and for your continued friendship. I wish you all a wonderful Christmas filled with the joy of family, friends, good food and holiday memories. Meri Kirihimete see you all in 2018. My Mandolin Quilt epp block is finished, I love how it turned out, now I need to ensure I use it in something, I'm thinking a cushion will be best. This was the very first quilt I ever made, you can read about it here. My first sunflower of the season is blooming, grown from seed too. Fingers crossed it survives the wind we are getting at present. A lot of my requested books turned up at once, so I think my summer reading is sorted for a little while. I'm currently enjoying The First Princess of Wales by Karen Harper. My tomato plant has fruit. This is a grafted plant which will apparently produce both red and yellow cherry tomatoes, it will be interesting to see which colour is more prolific. Hoping you are all having a wonderful week and that the Christmas madness is not too bad where ever you may be. 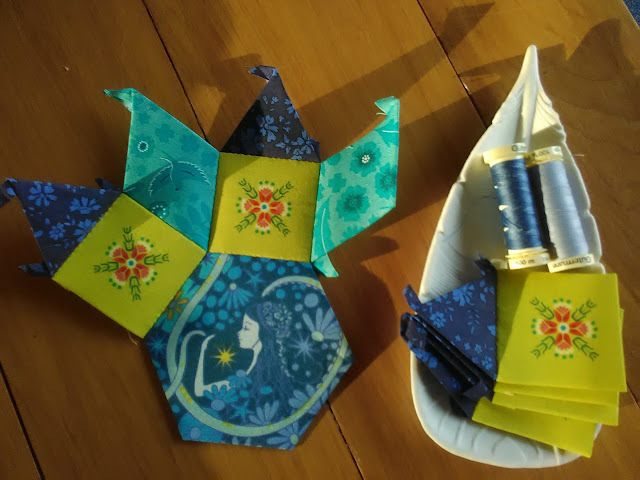 Towards the end of November, Jodi @ Tales of Cloth told us she had 200 free sets of papers for people to make her Mandolin Quilt block, which is her 2018 Quilt Club Project. I didn't want to commit to a full year of making this quilt, I still have my Ice Cream Soda quilt to finish, and I have my sights on another EPP project too. How ever I thought thought that one block would make quite a fun pillow. The idea being that I would make it in the same fabrics I used in the pillows I am making for my bedroom. Funny how ideas change. Using a fussy cut from Alison Glass Diving Board Collection for the centre hexi, the rest of the fabrics (all from my stash too) seemed to fall in place, after much dithering and seeking advice from friends and family over previous selections. Now it is just the pale grey squares and ditsy floral diamonds to be stitched on to this piece, before I can applique it to a background fabric. I should be finishing my other pillows, but my sewing room has been too hot over the past couple of weeks, so I am quite enjoying this hand sewing project I can do outside in the evenings. New Zealand is currently experiencing a run of glorious summer weather, with temperatures equivalent to what we normally receive in February. My summer loving garden has suddenly burst into colour. Won't be long before my sunflowers and cosmos are flowering. Hoping you have all had a lovely weekend. I have been thinking a lot lately about the projects I want to make/create and what I need to finish next year. It sounds like something I learnt at primary school - wants vs needs. Needless to say the want to make list is very long, and the need to make and finish list, substantially shorter. Unfortunately the majority of my 2018 projects will be off, the need to finish list . 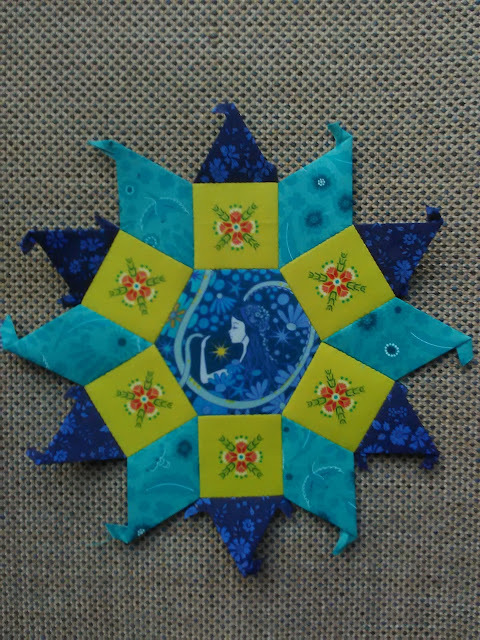 EPP Mandolin Block, this was a free offer from Jodi @ Tales of Cloth, basically advertising her new Block of the month project for 2018. I'm going to turn this block into a pillow cover, using some of the liberty from the ones I've just made, however it needs to be completed by 31 January. The making of two Drummers drumming decorations in time for Christmas. 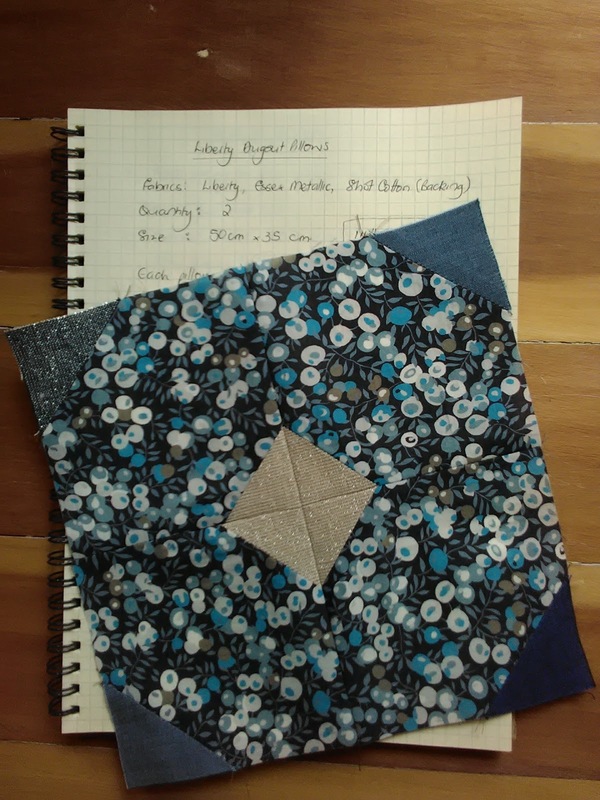 Sea Glass Sampler Quilt - this needs to be finished, and I mean the quilt top pieced, sandwiched, quilted and bound. I have a vague idea of getting it made in time for Miss B's 16th birthday, which is at the end of April. I bought batting, backing and binding fabric the other day,so I have no excuse not to get it done. 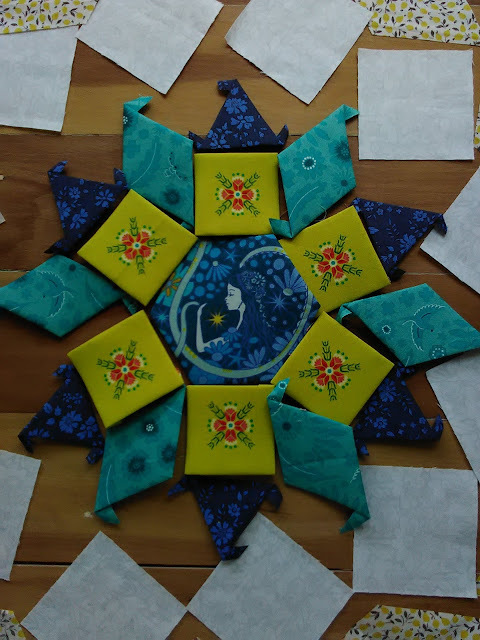 Solstice Dream - the new felt applique and embroidery project I am doing with my sister throughout the year - start date is January 1 and we have a year to complete our own versions of these. Midnight in the Tulip Garden - I would like to get this quilt top completed. Ice Cream Soda Quilt - all EPP blossoms completed and joined. AMH Quilt - sandwiched, basted, quilted and bound. Link up any post from the past week that features a sewing or stitching project you have been working on. Somewhere in your post, please link to this one. Also please take the time to read and comment on some of the other linked posts, it is always nice to know that people are reading what you have written, and we are trying to encourage people to keep blogging and reading blogs. This will be our last link up for 2017. With the Christmas season well and truly upon us, and then the following summer holidays for those of us in the Southern Hemisphere, Linda and I have decided to relax and enjoy them. 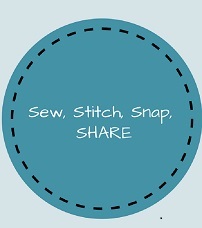 We are anticipating starting Sew Stitch Snap SHARE again on 7 February 2018. 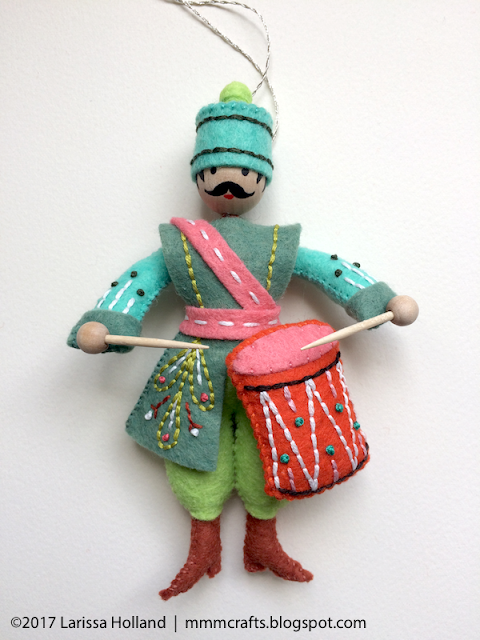 Thanks for joining us these past few months, it has been wonderful being inspired by so many talented quilters and finding some new and interesting blogs. We look forward to seeing you all in 2018. It's starting to look like Christmas and finally feel like Summer! Decorations made by my sister and me. Patterns from mmmcrafts. I love this corner of my house. My strawberry plants are probably used as ground cover plants more than fruiting plants, cos they don't get much sun, but I found a few wee sweet treats on them. My star jasmine is a mass of flowers, the scent is just divine. Baking - I just about have to fight Miss B off, to get a turn baking these days. She was out, so I made Black Velvet Zucchini Cake. Can we say it's sort of healthy with a vegetable and wholemeal flour in it? I want to make these too, however need to find some rosewater first. A few more ice cream soda blocks, only 24 to go now. Hoping you have all had a fabulous weekend too. I've had a little EPP frenzy this month and have managed to complete 8 Ice cream soda blocks. It has been nice to have a little slow stitching time in the evenings. A couple of months ago I succumbed and bought the acrylic templates for these blocks, and a mini rotary cutter. Oh my goodness, it has made fabric cutting so much easier and quicker for them. I have now completed 40 blossoms, I have another 32 to go, then all the filler pieces and half blossoms for the edges. Jodi @ Tales of Cloth finished her Ice Cream Soda Quilt the other day, so this has inspired all of us lagging behind on our quilts. I finally got around to getting back to that Liberty cushion/pillow I was making. I quilted it with a variegated thread, and an organic crosshatch - using masking tape as my guide lines. None of my marking pens showed up on the fabric. 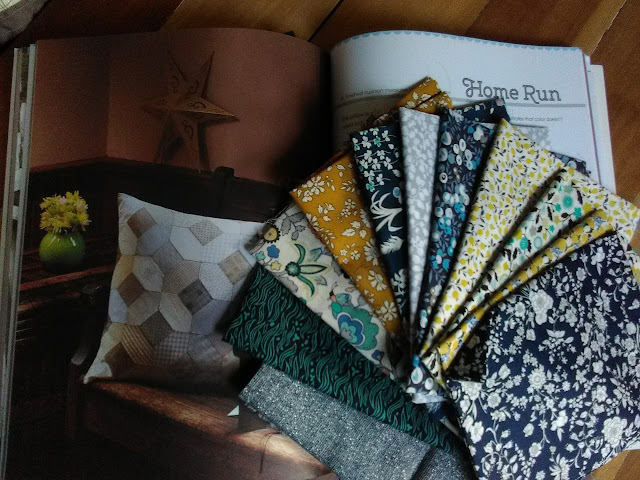 I based this pillow on the measurements for the Kansas Dugout pillow in Jen Kingwell's book Quilt Lovely. That's my pillow front done, now onto the one I made the one for The Scout. Originally I gad a plan for his, that wasn't going to involve too much Liberty (can't waste that on a male), however a slight miscalculation in my pattern measurements meant that I went improv for his. Made mainly out of linens, a little Liberty and some shot cottons which I pin tucked, but don't really show up in the photos. This pillow top has lots of texture and I think is well suited to a male. Both will co-ordinate with my room, add a little colour, but definitely won't be matchy machy. I just need to get some zips, and hopefully have new pillows made before Christmas. I have been inspired to pull out my ice cream soda blocks again, and have finished three in the past few days. One I had started before my self imposed rule about finishing Christmas decorations and my AMH quilt top. So there is definitely an odd one out in the group above. Jodi at Tales of Cloth, who created this block and the stitch along, has almost finished making hers - see here and here, this is very inspiring for those of us who have slowed down in the making of these blocks. I'm off to cut some more fabric and prep some pieces for more lunchtime and evening stitching. Of course, I now need to get back to finishing those pillows too. Loving // All the Dietes Grandiflora that are bursting into bloom , and other small signs of change in the garden- buds, berries, bright green growth. Drinking // Bubbles - cos I celebrated a birthday recently. Feeling // Proud, nervous and excited for Miss B, she acheived some fabulous results at school, and is about to start her NCEA exams next week. My little girl is growing up. Dreaming //Of a few days lying on a sunny beach, I'm so over cold windy days. Not feeling like spring here. I am married to The Scout, and am the mother of Miss B and Mr J. I am lucky enough to be able to work part-time and spend the rest of my time at home, where I can cook, craft, garden, read and occasionally find time to clean the house.